We have converted a former shop into a large 2-room holiday apartment with all modern conveniences. You can spend cosy hours in front of the fireplace in the stylish living room. Many books on Hamburg, one 52'-TV, as well as a Dolby Surround-Stereo and Sky+ ensure great entertainment. In the comfortable kitchen with swedish bench, american fridge and induction cooker, you will have a lot of fun with cooking and eating and spend sociable hours playing games. The bathroom leaves nothing to be desired. You will find a large corner bath tub, in which you can easily relax with two people. A special feature is the starlit sky over the bathtub, which keeps changing its colour. The XXL-shower offers a lot of space and boasts a rain shower. The designed glass-vanity unit is a real highlight. You can listen to your favourite music via two big speakers on the ceiling. Of course, there is floor heating and a towel warmer. The bedroom also offers a lot of luxury and comfort. This is a pretty apartment and well located to explore the city. Kind hosts and thoughtful appointments throughout. We enjoyed the patio and we'll appointed kitchen. Sehr schöne Wohnung mit einer traumhaften Badewanne und Kamin . We stayed for 6 nights in the Bille Suite and found it to be a very good base for exploring the city of Hamburg. The apartment is located in a quiet residential street only a few minutes walk from the airport bus stop (No. 39). It was very clean, comfortable and equipped to a very high standard. The sunny balcony was a bonus and ideal for relaxing after a day's sight seeing. The owners, Ulli and Michael, were very friendly and helpful and made us feel welcome from the moment we arrived. Overall we would recommend this apartment to anyone looking for an alternative to staying in a large characterless hotel. Besser geht es einfach nicht!! Die Top Adresse in Hamburg!! Die Wohnung, das Ambiente, die Lage …einfach ein Wohlfühlprogramm!! Ankommen und von der ersten Sekunde an „zu Hause“ sein. Das ganze wird dann rund durch die besten Vermieter die wir je kennen gelernt haben!! Vielen Dank an Uli und Michael!! Vielen Dank an Frau Simon, die vorbildlich für Ihre Mieter da ist! Die Wohnung ist toll und detailreich eingerichtet! Es fehlt an nichts und es sind sogar Getränke im Keller! Eine solche Wohnung haben wir persönlich noch nicht in unserem Urlaub kennengelernt! Vielen Dank! Wie immer ein Fest !!! Wir waren ja nun schon mehrfach in dieser wirklich wunderschönen Wohnung. Immer wieder gibt es nur 5 Sterne. Angefangen vom Kontakt zu den Vermietern ( DANKE liebe Ulli und DANKE lieber Micha) über die Ausstattung, Lage und, und, und ……. Eppendorf - one of the most beautiful districts of Hamburg. Here, Hamburg shows one of its most beautiful sides. Admire the Art Nouveau- style apartment buildings from the time around 1900. There is always something nice to discover. Very near to the “Hamburgdomizil”, there are 3 parks. The Eppendorfer Landstraße with its many boutiques and small shops invites you to a stroll. Try the home made ice-cream at “Eis-Schmidt”, they are opened even during the winter. Eppendorf boasts a huge variety of restaurants, bars and cafes. The starred chef Poletto has got her restaurant in the Eppendorfer Landstraße 80; you can find her wine-bar in the Eppendorfer Weg 287. The cultural aspect is also taken care of. You can reach the “Alma Hoppe” comedy house or the “Winterhuder Fährhaus”-theatre within a ten minute walk along the Alster-River. Public transport brings you within 20 minutes to the “Neue Flora” and “Tarzan”, or within 25 minutes to “The Lion King”. The red-light district, the Reeperbahn, is only 20 minutes away. Here, you can find “Schmidts Tivoli”, “Schmidt Theater”, “Criminal-Imperial Theater”, “St. Pauli-Theater” and the Operettenhaus. The most important tourist attractions, like the St.Pauli Landing Bridges, the port of Hamburg, Speicherstadt, the St. Michaelis Church, the town hall, the Alster-Arcades and the “Krameramtsstuben” can be reached by public transport within 20 minutes. From April until October, you can also do boat trips to the city centre on the Alster-River from the mooring near the Winterhuder Fährhaus. If you have the time and leisure, you can also walk along the Alster-River to the city centre of Hamburg. This would take you around one hour. If you are looking for wellness and spas, Hamburg is the right place for you. 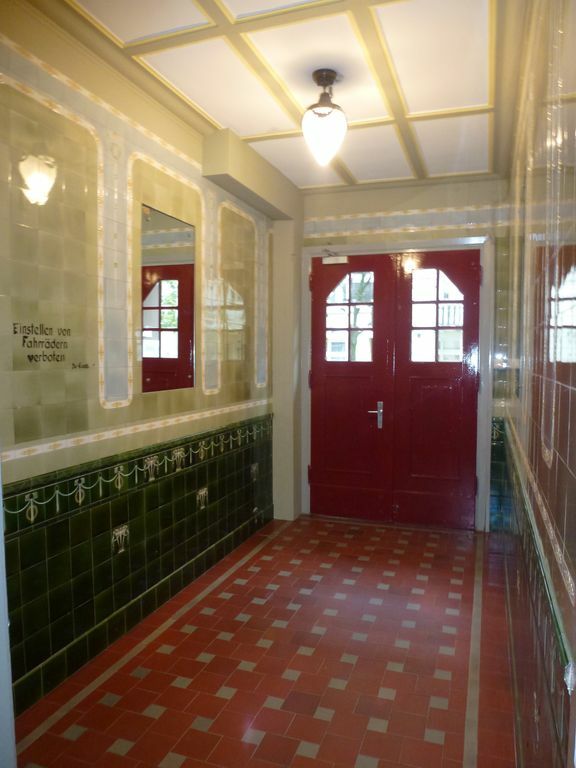 In the immediate vicinity of the Hamburgdomizil (only 10 minutes on foot), you will find one of the most beautiful spas of the city: the Art Nouveau-style “Holthusenbad”. But you may also want to try one of the 5 MeridianSpas. Right near to the Hamburgdomizil, you will find the MeridianSpa Eppendorf. If you like walking or cycling, Hamburg offers a well developed network of walking and cycling trails. You can start right at the Hamburgdomizil or take your bicycle with you in the public transport. Try cycling along the Elbe-River towards Wedel.